If you watched my foundation collection video, you know that I have a lot of foundation. Probably more than I should. Whoops! But the challenge that I talk about over and over again is that most foundations are not light enough for me. And if they are, they oxidize immediately and then become too dark. So many companies think they go light enough (or even dark enough), yet only end up covering the middle of the skin tone spectrum. So when I find formulas that are light enough or dare I say, even too light, I jump for joy! Here are two foundations I recently tried that have a super pale shade suitable for my Casper-like coloring. 1. EveLom Radiance Perfected Tinted Moisturizer in Alabaster – From the swatch on my arm, it seems a bit darker than the Dolce & Gabbana, but trust me this is as ghostly as I need it to be. The formulation is absolutely divine and while the name says it is a tinted moisturizer, it wears like a true foundation. The coverage is quite significant but still allows my skin to show through – a feat that many companies try to achieve but few rarely master. 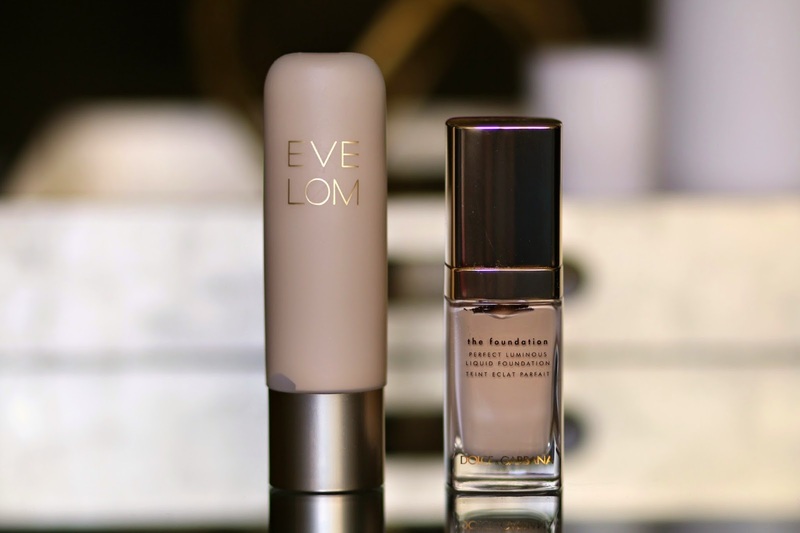 I initially tried the Eve Lom Radiance Lift Foundation and found it to be a bit too shiny for my oily skin, but the finish was beautiful so dry skin would probably love it. The Tinted Moisturizer is a better bet for oily skin with a finish that leans a bit more natural satin, so a setting powder will still be necessary. As far as staying power, it lasted all day for me with minimal touch ups needed. I found it a bit too heavy on extremely hot days, but now that the weather is cooling down, I can see myself getting a huge amount of wear out of this. 2. 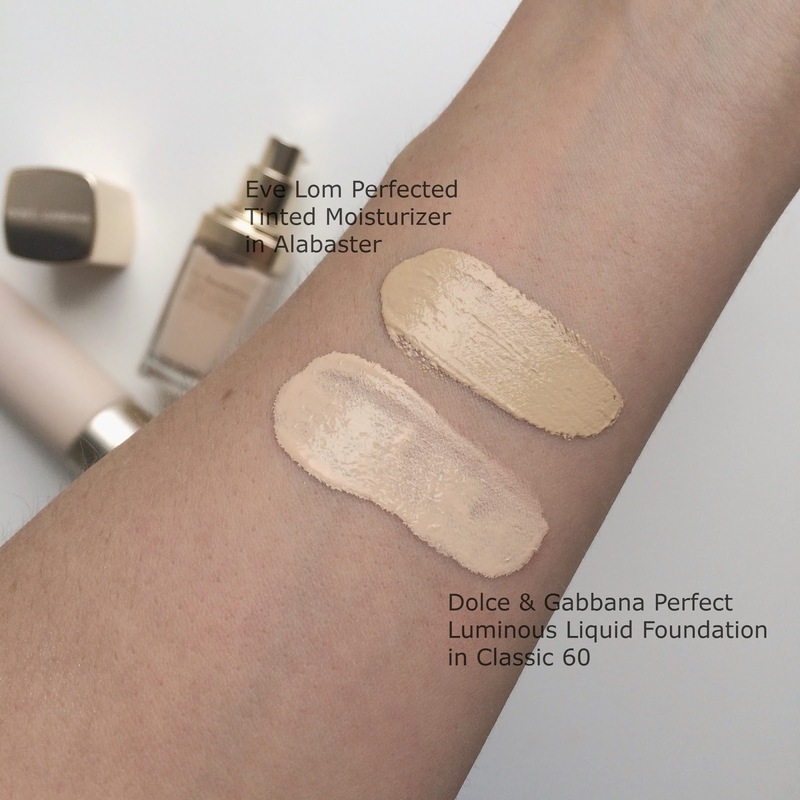 Dolce & Gabbana Perfect Luminous Liquid Foundation in Classic 60 - This may actually be one of the top 3 palest foundations I’ve ever tried and I love it for that! As I stated in my foundation video, the reason I tend to prefer paler foundations is that it allows me to wear bronzers and finishing powders to warm up my skin. Often when I purchase foundations that seem to be pale enough, I am unable to wear any of my favorite aforementioned powders over top because my base makeup almost always oxidizes. My oily skin is always a bit hesitant to try anything with the name “luminous” in the title, but I read such great reviews on this foundation so I decided to give it a go. I do find it works best when worn over a primer or if applied to bare skin, my skin needs to be a bit wet with moisturizer so that it buffs in perfectly. Though I was hesitant about the “glow” factor as implied by the name, the finish is more of a natural radiance than overly shiny. I do need a loose powder through my t-zone but other than that it wears for a good 6-8 hours on my skin.